United States with its capital Washington DC is located in North America (North America, bordering both the North Atlantic Ocean and the North Pacific Ocean). It covers some 9,833,521 square kilometers (about half the size of Russia) with 326,626,000 citizens. English, Spanish and French are the common languages used in United States (consider regional differences). Canada, Cuba and Mexico are bordering countries. The United States of America is a large country in North America. It also boasts the world's third largest population after China and India, with over 300 million people. The United States is not the America of television and movies. It is large, complex, and diverse, with distinct regional identities. Due to the distances involved, traveling between regions can be time-consuming and expensive. The overall climate is temperate, with notable exceptions. Alaska has Arctic tundra, while Hawaii and South Florida are tropical. The United States has exceptionally onerous and complicated visa requirements. Read up carefully before your visit. The United States is extraordinarily diverse in its array of attractions. You will never run out of things to see; even if you think you've exhausted what one place has to offer, the next destination is only a road trip away. While GSM has been gaining popularity, the U.S. uses the unusual 1900 and 850 MHz frequencies; check with your operator or mobile phone dealer to see if your phone is a tri-band or quad-band model that will work here. The topography is vast central plain, mountains in west, hills and low mountains in east with rugged mountains and broad river valleys in Alaska as well as rugged, volcanic topography in Hawaii. The average density of population is about 33 per km². The climate in United States can be described as mostly temperate, but tropical in Hawaii and Florida, arctic in Alaska, semiarid in the great plains west of the Mississippi River, and arid in the Great Basin of the southwest with low winter temperatures in the northwest are ameliorated occasionally in January and February by warm chinook winds from the eastern slopes of the Rocky Mountains. Potential natural disasters are earthquake activity around Pacific Basin, flooding, forest fires in the west, hurricanes along the Atlantic and Gulf of Mexico coasts, mud slides in California, permafrost in northern Alaska, a major impediment to development, tornadoes in the Midwest and Southeast, tsunamis, volcanic activity in the Hawaiian Islands, Western Alaska, the Pacific Northwest, and in the Northern Mariana Islands; both Mauna Loa (4,170 m) in Hawaii and Mount Rainier (4,392 m) in Washington have been deemed Decade Volcanoes by the International Asso and volcanoes. To reach someone United States dial +1 prior to a number. The local cellular networks are operated on 850 MHz, 1900 MHz, 3G, 4G. Websites typically end with the top level domain ".us". If you want to bring electric appliances (e.g. battery chaarger), keep in min the local 120 V - 60 Hz (plugs: A, B). The sign for the locally used currency Dollar is USD. 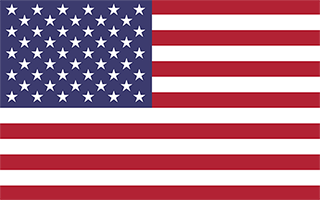 13 equal horizontal stripes of red (top and bottom) alternating with white; there is a blue rectangle in the upper hoist-side corner bearing 50 small, white, five-pointed stars arranged in nine offset horizontal rows of six stars (top and bottom) alternating with rows of five stars; the 50 stars represent the 50 states, the 13 stripes represent the 13 original colonies; the blue stands for loyalty, devotion, truth, justice, and friendship; red symbolizes courage, zeal, and fervency, while white denotes purity and rectitude of conduct; commonly referred to by its nickname of Old Glory.